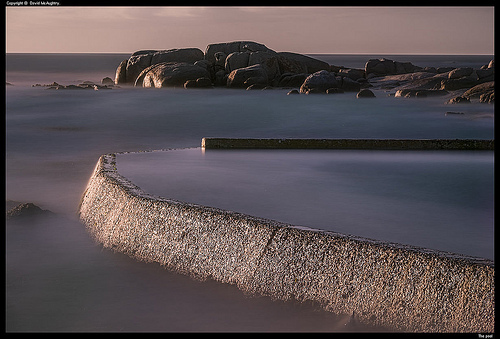 A Cape Town tagged image from photographer – David_McA as published on Flickr. All along the False Bay coast of the Cape peninsula there are specially built sea pools, designed to keep kids safe from waves (and possibly sharks). This is one of the most elaborate, at Miller’s point, near Simonstown. I took this at dawn, and liked the shimmering effect of the sea wall in the morning light. This is a 4 minute long exposure taken, unusually, with a telephoto, at about 100mm equivalent focal length. I did this so that the distant rocks fitted in the frame with the pool.